New York Times and USA Today Bestselling Author DIANE CAPRI Returns! 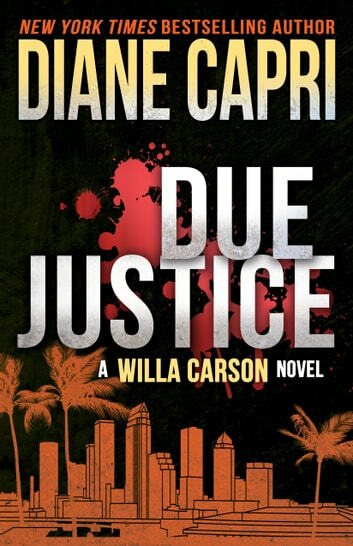 Judge Willa Carson is bullet proof – except when wild justice rules from the grip of a gun. When a famous plastic surgeon’s decomposed body surfaces in Tampa Bay with a bullet in its head, Federal Judge Willa Carson’s “little sister” is caught in a high-stakes game of greedy lawyers, blackmail and deceit. Carly Austin knew the victim too well. Does she know too much about the killer, too? Before Willa discovers the answer, Carly disappears. Can Willa save Carly from herself and the murderous conspiracy? Or have they killed Carly, too? Free-sprited Judge Wilhelmina Carson is quick, witty and stubborn. She finds nothing is what it seems in a world where attractive women with enough money are made, not born, and beauty can cost your life. Judge Willa debuts in this fast-paced mystery filled with great characters, humor and suspense. Really like this. Like the characters. A real woman living a real life. would have like the twist at the end to have had a little more build up. Certainly not the best written book. Plot was weak and predictable. The characters pretty light weight but good beach book.